A completely new, larger scan, and now c2c! Synopsis: Mora the apeman kidnaps Ann in order for her to be his mate. Kaänga and N'geeso track them and rescue Ann. 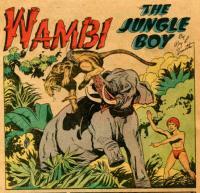 Synopsis: Wambi frees Ogg and other jungle animals captured by disreputable hunters. Synopsis: The T'luka tribe comes to claim Tabu's jungle. He uses his magic to frighten them and then turns the hair of the chief's daughter into snakes. The T'lukas leave his jungle and go home. Synopsis: A witch doctor poisons the water of the Dwanda village in order to drive the tribe away so a neighboring tribe can take their land. 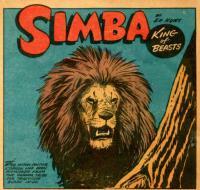 Despite drinking the poisoned water, Simba kills the dogs of the witch doctor and the witch doctor himself. Synopsis: The Sultan Rij is hypnotized into appearing mad by his daughter-in-law, who plans to usurp his throne. Synopsis: Two treasure hunters hope to extract the location of a gold mine from a hermit friendly with lions.